I had plans to use old jeans to make goody bags and a pinata, but it turned out to be too much work for what it was worth to me. The other part of the jean them would be his birthday cake, which would look like a pair of jeans. But when I pulled the horseshoe cake out of the oven, it broke. I tried to implant two cupcakes, but as you can see, it was disastrous. 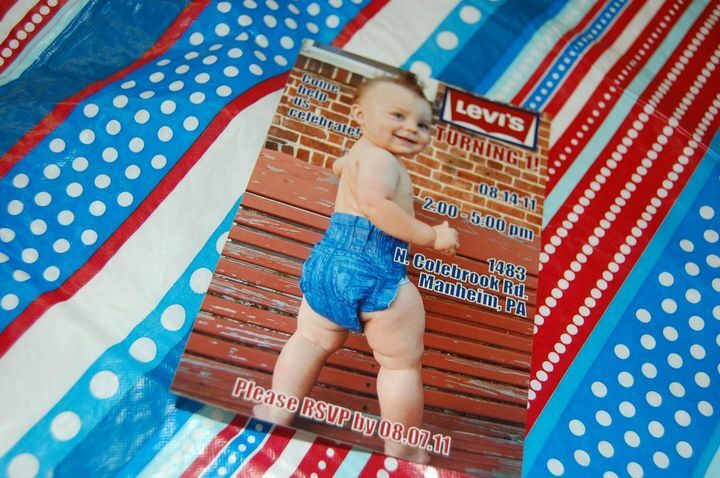 And thus, the denim theme kind of died, as did the cake idea. I've been enjoying cake decorating for about 2 years now, but with every cake I make I think, "This is the last one I'm doing." 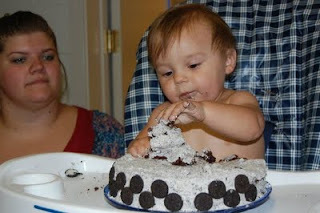 Decorating a cake takes me so long, and what do you do with it then? Just eat it! So lately, my love has been for cupcakes. Thanks to a simple Wilton frosting tip and some great go-to recipes, I can make a delicious looking cupcake and frost it in no time at all. Best of both worlds! 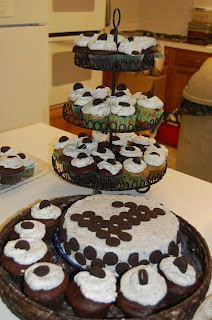 We had chocolate cupcakes with Oreo frosting, and Oreo cupcakes with Oreo frosting. And they were awesome, if I do say so myself. Thanks, Lemonade Makin' Momma for the recipe!! Do yourself a favor and try these suckers PRONTO! 1. Preheat the oven to whatever the cake mix box tells you to do. 2. Place cupcake liners in cupcake pan. Put one Oreo on the bottom of each liner. 3. Crush up remaining Oreos and set half aside for frosting. 4. Prepare yellow cake box mix as directed and mix in half of the Oreo crumbs. 5. Spoon the batter into liners and bake according to instructions (you may have to shorten the baking time because of the Oreo). 1. Beat butter with 1 1/2 cups of powdered sugar until pale and fluffy. 2. Gradually add an additional 5 1/4 cups powdered sugar. 3. Add milk and vanilla. Beat until pale and fluffy. 4. Stir in Oreo crumbs. When Herb bit into his cupcake he immediately said "She is a genius." Haha! They were amazing - especially the frosting. I could have eaten a tub of that. i loved the surprise oreo in the bottom!